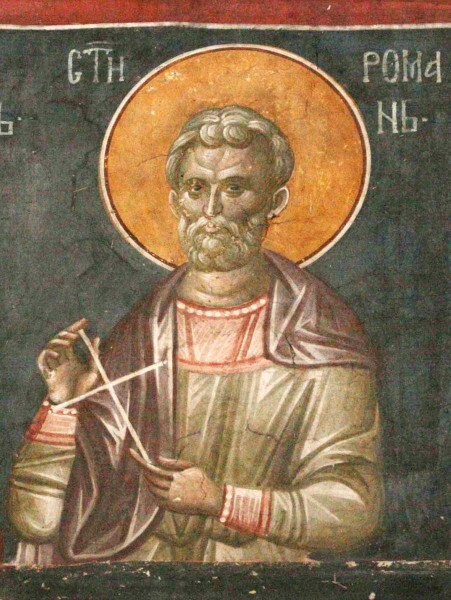 Saint Romanus the Wonderworker was born in the city of Rosa and lived an ascetical life on the outskirts of Antioch, acquiring the gifts of clairvoyance and healing. Through his intercession, the Lord granted many childless women the joy of motherhood. St Romanus was strict in his fasting, and he wore heavy chains beneath his hairshirt. The saint spent many years as a hermit without lighting a fire. Reaching old age, he departed to the Lord in peace. St Romanus is one of many saints to whom we pray for deliverance from childlessness and barreness. Some of the others are: St Stylianos (November 26), St Hypatius of Rufinus (March 31), Sts Theodore and John (July 12).